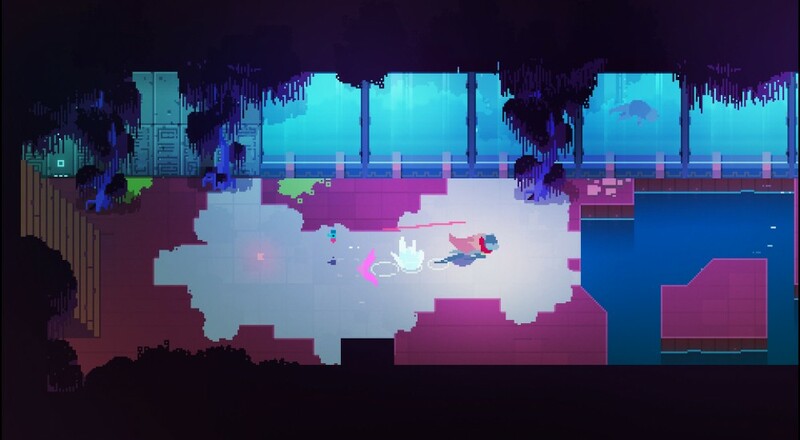 Initially released as a single-player only game, Hyper Light Drifter now supports two player couch co-op. This feature was a stretch goal for their Kickstarter campaign, which launched in September 2013, and while it didn't make it into the title for its initial release at the end of March, the developers have been working on getting it implemented into the game for the past month. If you're unfamiliar with Hyper Light Drifter, it's an action/adventure RPG that's equal parts Legend of Zelda: A Link to the Past and Dark Souls, with perhaps some of the mystery of Fez tossed in the mix. It requires patience to get a feel for the game's attack mechanics, and to learn enemy attack patterns, but the game rewards you for putting the time in. The newly added co-op mode will allow two players to play through the entire campaign together. At least one controller will be needed in order to get this to work. Once you're in the game, go into the "Settings" menu and set "Co-Op" to "On." The first player uses keyboard and mouse to control their character, while the second player uses the controller (or both players use a controller if you have two). The second player is free to drop-in/drop-out at any time by pressing the "Start" button (or its equivalent) at any time. One quick note about the second player's character: it is essentially a mirror-image of the first player. This means that the second player will only be able to use whatever abilities/guns the first player has unlocked. The second player has no control over which abilities to unlock, or which guns to equip; that all is controlled by the first player. Progress is saved for the first player only and Steam Achievements are disabled while co-op mode is turned on. Page created in 1.7835 seconds.